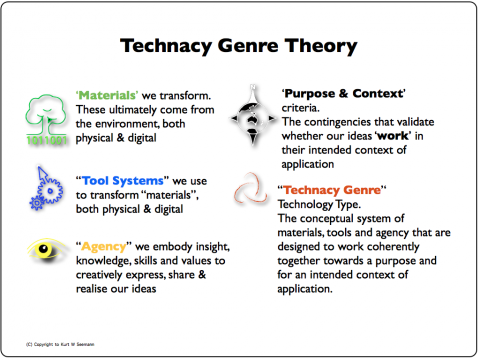 This Slide provides the definition of the essential elements that togther make up a coherent form or genre of technology. Tool Systems, including equipment, devices, instruments and software tools and devices. Materials, including physical or resistant materials, food ingredients, fabric and fibre, software data and file types, anything that is being 'shaped, transformed, altered, positioned, moved, covered, arranged, managed'. Agency, all encompassing of the values, knowledge, skills, techniques, organisation, method, and socio-cultural influences that together or in part is embodied or is an extension of the agent.